When I first moved to the Cape, the discovery of Cape Cod Community College’s Foreign Film Series was a great coup for someone suffering cinema withdrawal after leaving one of the world’s great film communities – New York City – for an extraordinarily beautiful place that lacked enthusiasm for movies. The series is a free program offered by the Department of Languages and Literature, so it’s somewhat surprising that the majority of films scheduled for this spring’s season are English-language films. Of the 13 weekly selections, 7 are in English, including 4 that are actually U.S. productions. Now, as I said, I am happy there is such a series here on the Cape, and I have included the entire schedule in my online calendar since it is the mission of the Cape Cod Film Society to advance film appreciation in this region, but it would seem the series programmer could use a reminder as to the need for foreign-language films to be shown theatrically here. Be that as it may, there are some great films on the schedule. Most notably, Ingmar Bergman’s classic film Wild Strawberries (1957) is showing on Tuesday, April 1st. I was lucky enough to have been introduced to this film in high school, which I’m sure is a rare experience because the film’s themes and its formal approach differ strongly from what an American teenager would be used to. And yet this is a great example of the power of cinema: how a film can bring us to understand something outside our own lived experiences and make us better people. In Bergman’s film, an aging professor has a kind of existential crisis as he looks back on his life. The surreal dream sequences and a maddeningly quiet sound design, as well as masterful performances by Victor Sjostrom and Bibi Andersson make this one of Bergman’s finest films. It is also one of the first of his features to be shown and appreciated on the U.S.’s burgeoning arthouse film circuit of the late 1950s. Put this one on your calendar to see. The second film that I would love to revisit is Venus, which features Peter O’Toole in one of his last starring roles. Again, the film deals with aging, but it does so in such a beautiful way, never reducing its main character to tired stereotypes, which in this culture vacillate between old fools and wise souls. O’Toole plays Maurice, a septuagenarian actor who is still very much a man in that he appreciates beautiful women and doesn’t always think with his brain. O’Toole was nominated for an Academy Award for that performance, but lost to Forest Whitaker, who also did an incredible job portraying Idi Amin in The Last King of Scotland. There are also a couple of films I haven’t seen, like the Turkish feature Watchtower, directed by Pelin Esmer, showing on March 11th, and the week before that, Off White Lies, an Israeli film directed by Maya Kenig. Both of these look promising as well. It’s cold outside and probably will be for a while, so check out some of these films at CCCC. All films start at 3:30 p.m. and screen in Lecture Hall A in the Science Building at Cape Cod Community College, 2240 Iyanough Rd., W. Barnstable (Exit 6 off of Rte. 6). Parking is available in lots 5, 6, & 7 at CCCC. For more information call 508.362.2131 ext. 4453. I’m currently preparing to teach a course in film history, which I haven’t taught in about 6 years, (although film history figures into the other courses I regularly teach). My favorite thing about preparing for a new course is getting the chance to revisit films I’ve known and loved since childhood within the new context of a history of film. In some cases, these are films that are much older than I am, but which I saw in a high school film appreciation class or at one of the many repertory film houses we had in New York when I was growing up; others are films that I saw in the theater when they came out. Looking at the former brings back all the early enthusiasm I had for learning about movies and seeing classics for the first time while looking at the latter gives me a chance to see new things about them that I couldn’t have understood at the time, either because of my age (my father started taking me to movies quite young), or because in hindsight these films turned out to be something more than just a Saturday afternoon matinee. I was just watching Chaplin’s first feature The Kid (1921) and remembering how I fell utterly in love with him when I first saw the film as a teenager. He was doing what I wanted to do. As a musician just starting to dabble in filmmaking and unsure of how to do both, I was so impressed with how very independent and talented Chaplin was: writing, directing, producing, and even composing music for his silent films. I haven’t thought about this movie in a very long time, but I had a poster of it in my bedroom next to my other teenage interest, like Ozzy and Aerosmith. Seeing it again reminds me of why I wanted to be a filmmaker. But also, this time around, I started to recognize how this very simple story has been duplicated so many times in movies around the world. 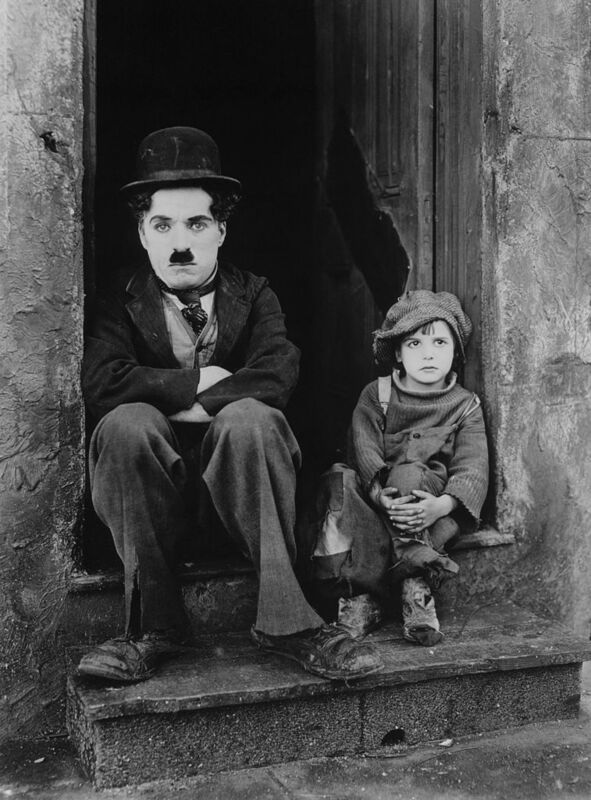 For those who haven’t seen it, Chaplin’s Little Tramp character finds a child that has been left in the street. He is a poor man barely able to take care of himself and at first he tries everything to give the child to someone else, but eventually, he assumes responsibility for him and raises him until the mother finds him again five years later. It is about that bond between the Tramp and the Kid. It’s very sweet and innocent, but it’s a plot that Hollywood in particular loves to repeat. There’s the one where Walter Matthau suddenly has to take care of a little girl (Little Miss Marker), itself a remake of another version starring Shirley Temple in 1934; Diane Keaton switches the gender on this theme in Baby Boom; the ridiculous 3 Men and a Baby picks up the same theme but with three unlikely fathers; and the recent Mexican import Instructions Not Included also has a man unexpectedly having to man up and be a dad. I know there are many others with this basic concept, particularly from the past – 1980s, 90s, etc. Can anyone add to the list? Here is a link to an article I wrote for Cineaste magazine several years ago. This piece talks about a trend called microcinema that has been growing as movie goers have become less and less satisfied with the typical movie theater experience, whether due to the lack of diversity in films showing, ticket prices, or concession stand offerings. I hope to update this piece some time soon, as even in the past 6 or 7 years, there have been big changes. Enjoy!